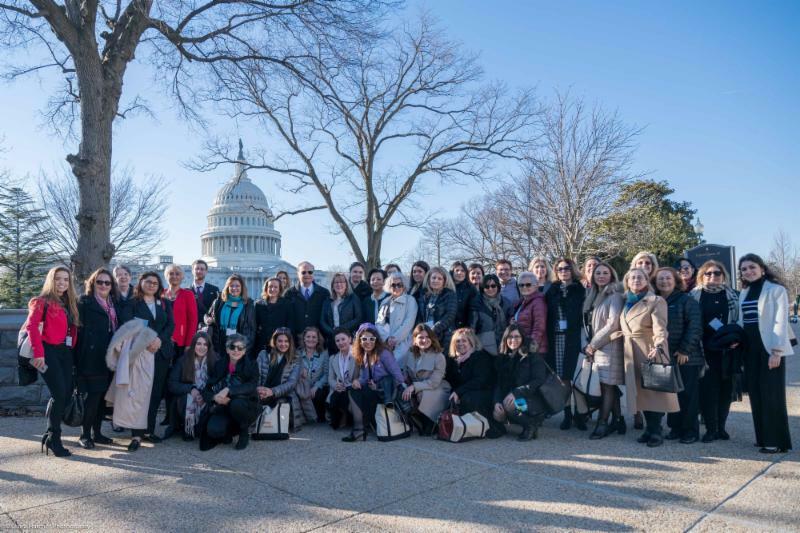 On March 11-12, 2019, the Turkish Coalition of America held its First Annual Turkish American Women Leadership Forum in Washington, D.C.
34 distinguished female community leaders from all regions of the United States traveled to the nation’s capital for discussions on enhancing women’s political engagement. In addition to working sessions with leading experts, they met with 12 Members of the 116th Congress and senior staff. The Forum highlighted the leadership role that Turkish American women can play in their communities in reaching out to their elected representatives and raising the Turkish American voice on the local, state and federal levels. The executive summary of the event can be found here. The TCA team met with the following members of Congress at various events in Washington, D.C.
On March 13, TCA President G. Lincoln McCurdy and TCA Operations Director Louette Ragusa attended the CBC Chairman's Dinner. They spokewith CBCPAC Chairman Gregory Meeks (D-NY/5th), Democratic Congressional Campaign Committee (DCCC) Chairwoman Cheri Bustos (D-IL/17th), Assistant Majority Leader Ben Lujan (D-NM/3rd) and Representatives Barbara Lee (D-CA/13th), Jahana Hayes (D-CT/5th), Lucy McBath (D-GA/6th), Eddie Bernice Johnson (D-TX/30th), Andre Carson (D-IN/7th) and Brenda Lawrence (D-MI/14th). Presidential candidates Senators Kamala Harris (D-CA) and Cory Booker (D-NJ) were keynote speakers. On March 22, TCA Program Director Nilsu Goren attended a DCCC political update briefing on Capitol Hill. On March 27, TCA Directors Nilsu Goren and Louette Ragusa attended the DCCC Spring Reception, hosted by DCCC Chairwoman Cheri Bustos and attended by House Speaker Nancy Pelosi. On March 28-30, TCA President G. Lincoln McCurdy attended the Congressional Black Caucus (CBC) PAC Spring Meeting in Palm Springs, CA. He spoke with Reps. Greg Meeks (D-NY/5th), CBCPAC Chairman; Barbara Lee (D-CA/13th); Gwen Moore (WI/4th); and Steven Horsford (D-NV/4th).